It is easy to assume that the natural world around us is separate from human lifestyles. We travel hours, if not days away from our homes just to see a natural habitat or for the chance to see a wild animal. Many species of plants and animals prefer to live in natural habitats far away from humans, but others have shown to take a very different life style. It may be common to see an occasional raccoon or squirrel running through our yard or picking through our trash, but these animals make up only a fraction of the ecosystems that reside in the inner city. Want these articles delivered right to your inbox every week? Click here to sign up! Many towns and cities across the world contain wildlife and even diverse ecosystems, right outside our front doors. Even in our local city of Vail, the natural world thrives outside every home and shop as an urban ecosystem. Urban wildlife populations are prime examples of unique adaptation and perseverance, and help to reveal human’s important connection to the natural world. Urban wildlife ecology is a relatively new biological field of study, and is quickly gaining attention and popularity. Ecologists and Biologists are finding that many species that live in inner cities are not lost or there by chance, but are instead purposefully making a home among industry and urbanization. Many urban wildlife populations utilize city parks, river trails, residential areas and green spaces to eat, drink, sleep and even breed. While wildlife flourishes in natural and expansive habitats, there are many ways that wildlife populations have adapted to live in patches of habitat present in urban cities. These patches of natural habitat are known as habitat fragments and are necessary for the survival of wildlife within cities and towns. Habitat fragments can be isolated from each other, resulting in vastly different communities of plants and wildlife inhabiting them. This diversity due to isolation means that our friends across town may not see the same species of animals as we do. Some habitat fragments may be better suited for aquatic and semi-aquatic animals like frogs and muskrats while others provide perfect habitat for grassland species like foxes and deer. Habitat fragments may be easily noticeable or slightly camouflaged, but there are a few things we can all do to help keep them and the ecosystems they hold safe! Urban wildlife is incredibly important to our own livelihood every day. Bees and other pollinating insects that reside in urban areas keep our gardens healthy and are the sole reason why we can buy fruits and vegetables in our grocery stores. 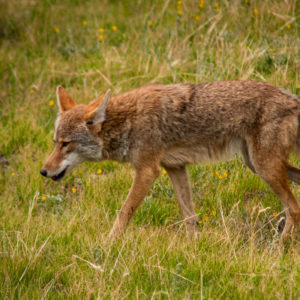 Small predators like foxes and coyotes in the city help to keep pest numbers under control. There are countless ways that urban wildlife benefits us, and the least we can do is return the favor by helping keep these ecosystems healthy. Even though it may not be clear to us, there is plenty of food and water available for animals in the city. If we begin to feed these animals, they will learn to only look for food from people and will lose their natural ability to forage and hunt for food. If you see an animal that appears to be struggling or emaciated, contact your local wildlife agency or rehabilitation center. Keep your trash secured in a wildlife safe container. Wild animals will take advantage of any food they can get their mouths on, and it is our job to deter them from eating our garbage. These are just a few of the many ways you can help urban wildlife in your area, and will decrease negative encounters between humans and wildlife. It is possible for humans and wild animals to live peacefully together, and with just a little effort, we can make sure this relationship stays healthy! Bella Harris was a naturalist at Walking Mountains Science Center in Avon, CO. She loves studying Wildlife Ecology and hiking with her dog, Drake!